What color is the N SEOUL TOWER lights tonight?? N SEOUL TOWER`s various colors give warmth to the world. Seoul city is continually making the efforts to reduce energy demand and promote renewable energy. If the air quality is clean (fine dust concentration under 45㎍/㎥), the color of the N SEOUL TOWER shines in a brilliant sky blue. This color means "It is really good to do outdoors activities and go for a walk today". 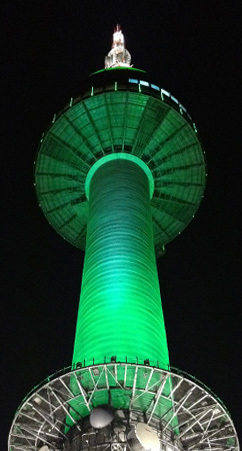 The green color of the N SEOUL TOWER, which represents the green nature of Namsan Mountain, means the love of the Earth. Also, with the N SEOUL TOWER, the Allure Green Campaign is held in Namsan, meditating on the value of the environment. The N SEOUL TOWER shines a red light every World Blood Donation Day (June 14), portraying the importance of blood donation as well as showing gratitude to donors. The N SEOUL TOWER supports and roots for the blood donations campaigns for love held by the Red Cross. The Earth Hour event is held every last Saturday of March worldwide, turning off the lights for an hour in order to decrease carbon emission. The N SEOUL TOWER also actively participates in the event by turning off its lights. Seoul`s history and tradition at a glance! Meet the Media Art with the diverse stories.